The final opera of Puccini, completed by Toscanini, with its roots in Chinese folk tales and recognisable melodious hit “Nessun dorma!” is one of the all time favourites for most of opera houses. Usually the story also gets beautiful sets and keeps traditional Chinese flavour both in music and appearances. The Metropolitan Opera production is one of the most impressive examples, with current production by Franco Zeffirelli running since 1987. 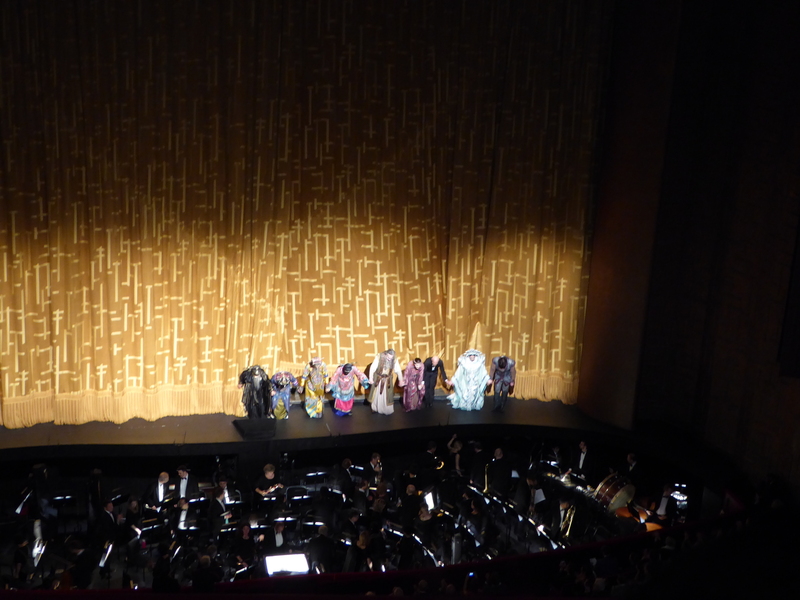 It has seen James Levine conducting, Placido Domingo, Luciano Pavarotti, Johan Botha and Marcello Giordani as Calaf, Maria Guleghina as Turandot and Angela Gheorghiu and Teresa Stratas as Liu. 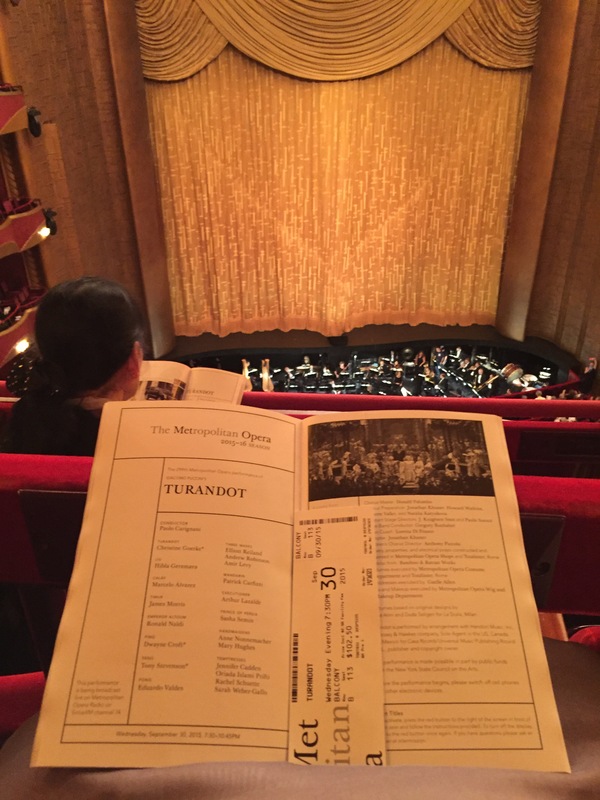 The performance on September 30th I have attended was 299th for Metropolitan Opera, and the third of 2015-2016 season. In the beginning the impression of the set was a bit too dark, especially looking the stage from the top of the house as the people entering it were wearing greyish clothes that blended in the night scene perfectly. The fun characters of Ping, Pang and Pong created more colourful accents as belonged to royal court rather than common people. Regardless of the first impression, Zeffirelli set design is very impressive, rich in detail and costumes are breathtaking for the revival! The opening of scene 2 of Act II created collective sigh of surprise in the audience, as it was visually so impressive and in contrast with initial setting of Act I, and raised platform with distant Turandot encircled with her maids created a real fairy tale atmosphere. The only drawback of the staging was location of the Emperor so deep in the stage that his voice was practically sinking in the depth of the palace. 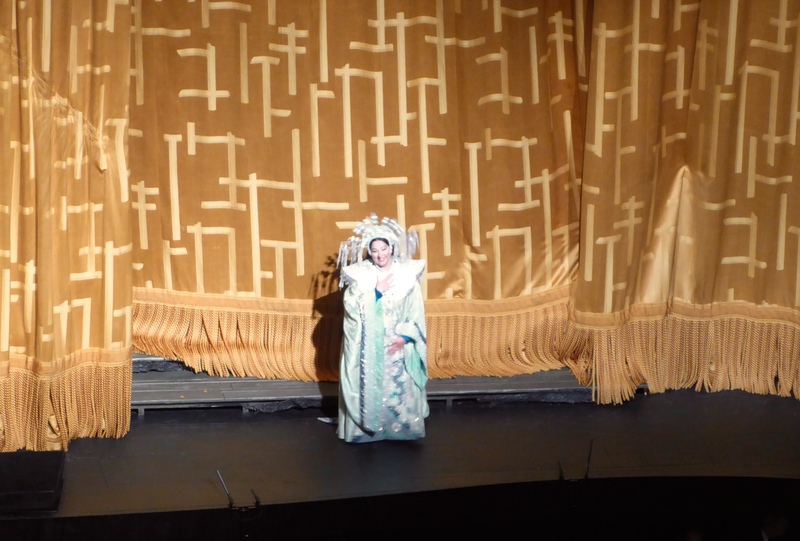 It was my first time seeing Marcelo Alvarez in the role of Calaf, having heard him singing only “Nessun dorma!” in recitals before, and even if his acting seemed bit artificial at some moments, the singing was nuanced and emotionally filled, with characteristic high notes perfectly delivered. It sounded as if he needed some time to warm up, as in the first scenes it felt that top notes are forced, till Act III and his main arias Alvarez was in top form and created brave, confident and vocally strong Calaf. 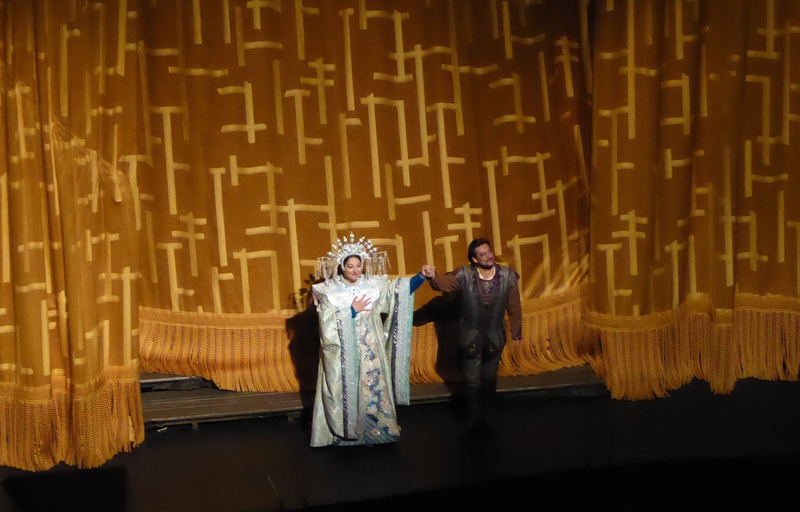 Christine Goerke as Turandot succeeded in portraying transformation from cold-hearted and distanced princess, ruthlessly slaying all her suitors to fragile and sensitive young woman in love. Her impressive dramatic soprano is well suited for the role, and the audience appreciated her performance enthusiastically. Even if understanding that her shrilly metallic tone was masterfully used for the purpose of creating character, I would have preferred her using a bit softer sound. Understandably her tone changed for the final scene and the contrast told most of the transformation story, and undeniably Goerke’s vocal capabilities and mastery are very impressive. There were some people including me wondering if Hibla Gerzmava as the casting choice for Liu was the best option since the stereotype for the character is weak, helpless woman sacrificing her life for higher purpose and thus would require tender, lyric soprano. All the worries regards right fit were biased, as strong and rich voice of Hibla Gerzmava added more meaning and opened new angles how to look at her heroine. Determined, courageous, self-confident and tenderly loving young woman consciously choosing her destiny and sacrificing her life for one she loves more than herself – she made the suicide scene dramatically intense and touching. Conductor Paolo Carignani gave good energetic tempi to the orchestra, which sounded perfectly, combining traditional Chinese melodies with Italian operatic flavour, creating easy recognisable Puccini tone. In the beginning The Met chorus sounded a bit sharp, the sound improved noticeably during first scene, and further on the chorus delivered impeccable singing. Overall impression of the performance was good but not extraordinary, even if singers did their best, orchestra and chorus supported them well, and the sets and costumes established environment for grand spectacle – some immaterial stage chemistry and passion unfortunately was missing there. If you would like to see classical staging of one of the remaining Zeffirelli productions, this one could be right choice to enjoy if you happen to visit The Met!